I used to like this stuff until I got stoned and ate a large chunk of wasabi and haven’t been able to enjoy it since. But it’s still damn good and well worth the 10 minutes it takes to make it from scratch. 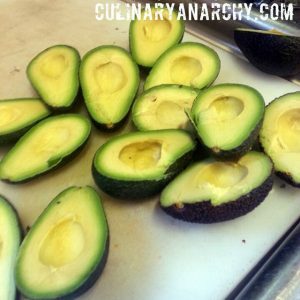 Cut the Avocados in half by cutting to the seed (its big, don’t try to cut through it) and moving your knife around it. Twist apart and scrape out the good stuff into the mixing bowl. Add the rest of the ingredients and adjust to taste. Just like Salsa, there is a lot of room for play in terms of both flavor and texture. Want it smoother? Fine chop everything and mix with a Whisk. Want a bit of a kick? Add fresh peppers. Personally, hell yes. In the Kitchen at work I keep getting the people who say it tastes like soap and they keep sending it back. I use Cilantro with a very heavy hand at home though. Good call catching that, I’m happy to see my readers are paying attention. High five Krista!